A neonatal transilluminator designed specifically with the neonate in mind. 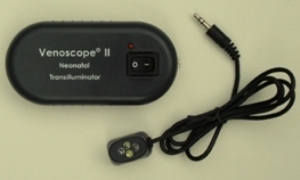 The great features of the Venoscope® II has taken and put them into a transilluminator that better serves the special needs of neonatal patients. It still features the same powerful LED lights, but is now smaller and more portable, making it even easier to maneuver around neonates. The cool lights are strong enough to illuminate the hardest to find veins without the risk of burning the baby. Creating happier babies makes happier nurses. The Neonatal Transilluminator weighs just 6 ounces including the 3 "AA" batteries. It features a low battery indicator light that alerts the nurse to change the batties. The Disposable Protective Covers are made of clear plastic, no latex, and are designed to cover the Neonatal Transilluminator LED lights so that blood or body fluids do not contaminate the light. The covers are approximately 9 inches long and packaged in a convenient box of 50 covers. The Detachable Cord for the Neonatal Transilluminator is designed to disconnect if the cord is stretched too far. Simply reconnect it and continue.